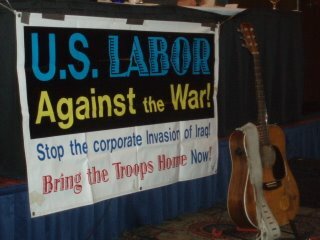 US LABOR AGAINST THE WAR IN CLEVELAND WITH CINDY SHEEHAN! Now that "Buy Nothing Day" is over, I'm sure that some of you are looking for unique holiday gifts. I hope you'll stop by CDBaby and stuff some stockings with my CDs. I've replenished CDBaby's inventory of Have You Been to Jail for Justice?, Union Maid, and If I Can't Dance ... and you can also get the Wild Wimmin for Peace CD, Heartland, Vote in November, Look to the Left, and the last three copies of Live from the Wholly Stolen Empire. AND I've got ten of those hand-cranked Swedish music boxes that play "The Internationale." You can order them directly from me. Email me at anne@annefeeney.com if you want one... They're $50 + $5 shipping/handling. If CDBaby sells out, I'll also be doing CD sales directly from the house during December... just email me. 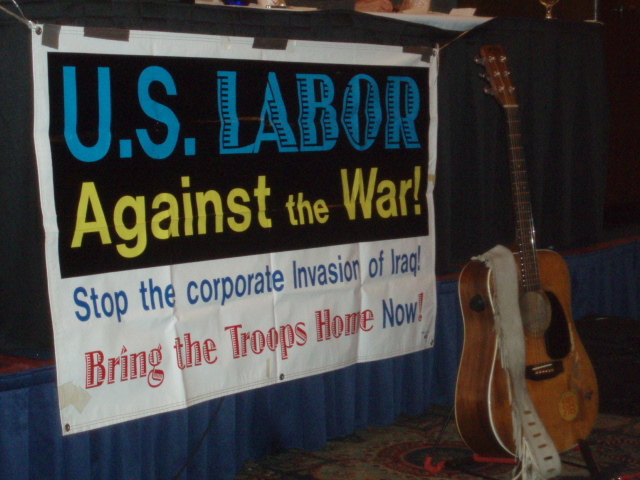 I'll be leaving tomorrow for the US Labor Against the War national conference in Cleveland, and I'm very excited to finally be meeting Cindy Sheehan. thanks to Patrick Carano for the photos! On Monday night, Dec 4th, my friend Jerry Starr debuts his new play, BURIED: the story of the Sago Mine Disaster in a standing-room-only reading at Pittsburgh Playwrights. Directed by the amazing Marci Wood, the play features an all-star cast and music by me and Sue Powers. The reading will be filmed in the hope of finding funding for full-scale productions in 2007. This was a challenging year. This is the first year that I bought more sympathy cards than birthday cards. Both my mother-in-law and father-in-law died this year in Sweden. I'm mourning the loss of so many friends this year, as well as my generous mentor, Joe Glazer, my beloved Kerrville camping companero Blair Powell, and especially my longtime performing partner and dear friend, DC Fitzgerald. As this holiday season approaches, I hope you're surrounded by family and friends. I'm hoping to have both my kids and my husband here in Pittsburgh for the holidays. Keep the folks of Oaxaca in your thoughts and prayers. I look forward to seeing you in 2007, and thank you from the bottom of my heart for all the kindness and generosity you have shown me. We'll have plenty of work to do next year, so take a little time off now to enjoy each other and relax! NOW!! ORDER MY MUSIC IN THE UK! Four Dogs Music is a new UK music site operated by Ethical Wares and featuring great music from all over the world... including mine! If you're across the pond, order from Four Dogs for prompt delivery. It takes a college degree to fly a plane but only a high school diploma to fix one: a reassurance for those of us who fly routinely in our jobs. After every flight, Qantas pilots fill out a form, called a "gripe sheet," which tells mechanics about problems with the aircraft. The mechanics correct the problems; document their repairs on the form, and then pilots review the gripe sheets before the next flight. Never let it be said that ground crews lack a sense of humour. Here are some maintenance complaints submitted by Qantas Pilots (marked with a P) and the Solutions Recorded (marked with an S) by Maintenance Engineers. S: Live bugs on order. P: Autopilot in altitude-hold mode produces a 200-feet per minute descent. Merry Christmas, Happy Hanukkah, Joyous Solstice, Festive Kwanzaa --- however you're celebrating, I wish you all the best and thank you so much for your friendship and love and support! This election is about that, but much more - it's about honor, dignity and comity in this country. It's about the Constitution, which gives us this great nation. Bush ran on a pledge of "restoring honor and integrity" to the White House. Instead, he brought us Tom DeLay, Roy Blunt, Katherine Harris, John Doolittle, Jerry Lewis, Richard Pombo, Mark Foley, Dennis Hastert, David Safavian, Jack Abramoff, Ralph Reed, Karl Rove and an illegal and immoral war in Iraq. People, it's up to you. If this was forwarded to you, or you're reading it on my blog, you can subscribe by going to my website and signing up! 1) almost all of my music is downloadable at most online stores, including iTunes, Yahoo music, AOL and many many more? Anne sings with all the joy and gusto of a true, dancing revolutionary. She is rare in her bare honesty. Her musicality is beyond reproach. I have to say that lots of times I don't get past the seventh cut, "Let Their Heads Roll," because it's so good, and she performs is so perfectly, I put the CD player on "repeat" for a while. I'm sure I'll cover it, though it will be a challenge, given her fabulous rendition. I have seen her LIVE several times and she never ceases to amaze. I will recommend this CD to all my friends on the left. It is a very good CD. Every song on the CD is enjoyable. I would recommend this to others. Gets an A in my book! time. The tribute to Rosa Parks (My Feet Are Tired) is the kind of song I thought no one sang any more, with lots of message, and oh, so much music. Anne, you're a knockout on this CD, a great singer with a sharp sense of humor and justice, and a fine touch in selecting songs. This CD is hard-hitting politically and terrifically musical. Get it, play it for yourself and your friends! 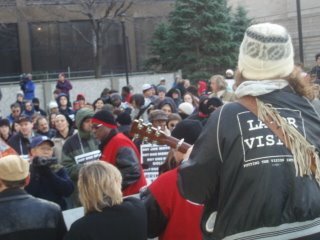 5) now you can pre-order or donate toward the new CD, "Dump the Bosses Off Your Back," using Paypal, VISA or MC finding the DONATE button on my blog or my Earthlink site, or Myspace -- I'm still about $11,000 away from finishing it, but it will happen! 6) You could be the 100,000th visitor to my website if you hurry! Kudos and hearty thanks to hardworking UBC member and talented web designer Dave Livingston of Nelson, BC for the terrific job he does maintaining my website. Thanks to everyone who has visited my website in the last two years ... especially those of you who left a message in the guestbook or signed up for the newsletter. For months we have been worried about the massing of repressive force threatening the teachers union and APPO in Oaxaca by state authorities of Governor Ulysses Ruiz. Now it appears they have begun the repression against people operating radio station Planton and shooting at people in the plaza. Newspapers are reporting that primary school teacher Emilio Alonso was gunned down and that Indymedia reporter Brad Will was shot in the chest and killed in the municipality of Calicante and a photographer Oswaldo Ramirez was shot and wounded. There are rumors that other teachers have been shot and killed and that there are many injured. Is your government planning to repeat the shame of the massacre at Tlatelolco in 1968, which people around the world still remember? We are watching with alarm. We urge you in the strongest terms to stop the repression and violence against the people of Oaxaca and the teachers union. You must use your power to stop Governor Ruiz from committing a massacre. It's way too late at night for me to be prudently pondering world affairs... I don't know if it's the jetlag and time-zone shifting, or the endless barrage of death and sadness that shrouds our country right now, but I've been waking up a lot in the middle of the night. I read an interesting article a while back that contended that mental illness skyrocketed in Great Britain when conservatives were in power. If my memory serves me correctly, the author maintained that the perceived mean-spiritedness of the many social safety net cutbacks that accompany conservative governments, as well as the actual decline in available services to the vulnerable, was responsible for the escalated instances of depression, paranoia and suicide. How do you suppose that translates in the United States, where FOX news has a "terror alert" icon visible throughout most of its broadcast day? ... where we're told the threat is ubiquitous? that we are to be vigilant reporting anything suspicious to the government? what do you suppose happens to people on the edge of paranoid schizophrenia at times like that? add to the mix tens of millions of Americans with no health insurance, and millions more with no coverage for mental illness... and public health agencies that are being slowly destroyed by hiring freezes and layoffs... as my friend John Handcox observed, "There's mean things happenin' in this land." We constantly hear politicians reciting the mantra that this is the greatest country in the world. There are concrete ways of measuring that claim. The "greatest country in the world" shouldn't be 45th in infant mortality, have a higher illiteracy rate than Cuba, have the largest gap between productivity and wages, send 20% of its children to bed hungry every night. I think of Alyssa Peterson, the idealistic 27 year old woman who enlisted in the Army to serve as a translator. She actually arranged to switch places with someone who didn't want to be sent to Iraq. After several "harsh" interrogations in "the cage," where she served as translator, this young woman apparently turned her rifle on herself, becoming the third female soldier to die in Iraq. with the cost of prescription drugs and medicare supplements? Keep your eyes open. I see men and women well into their 70's working at rest stops along the turnpike in the middle of the night, at convenience stores ... we are returning to the days where people must work until the day that they die. There are plenty of folks in Washington who are nostalgic about their imagined "good old days" in America -- and those days included colorful old people on the street corners selling apples and pencils. Coming soon to your neighborhood. I think of the impending massacre in beautiful Oaxaca, Mexico, where schoolteachers have refused to work until they achieve decent wages, decent funding for education, and an end to the corrupt government of Governor Ulysses Ruiz. Thousands of ordinary citizens in this ancient city have constructed makeshift barricades, shut down the city, and declared a general strike until the teachers' demands are met. A 36 year old journalist documenting this grassroots movement, Brad Will, from New York City, was fatally shot in the chest on October 27th by plainclothes paramilitaries. I think of the Congress and President that just passed an unfunded mandate for a 7+ billion dollar 700 mile wall along our border. ballot... like you, I'll be tuning in on November 7th to find out. godwyer(at)pvnccdsb.on.ca - Gary O'Dwyer is the contact -- Thomas Merton Award winner Kathy Kelly from Voices in the Wilderness and Eric LaCompte from School of the Americas Watch will be there too! Price: free, with David Rovics! feel free to bring snacks and musical instruments for a little song swap afterward. 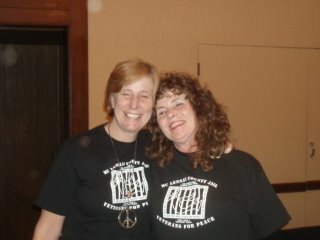 Lisa and Naomi have turned this venue into a great music spot. Come by to hear some fabulous New England performers and my 45 minute feature set. I'll be doing a 35 minute feature set at Geoff's legendary open stage -- you never know who might drop in to visit Geoff - one of the great talents and great hearts in folk music! The Cantab is a great spot to visit in Cambridge. advance tickets widely available. check the website. and the theater is accessible too! I'll be doing some music ... more details soon... save the date! I'll be there.. hope to see you too! Proceeds benefit the Labor Heritage Foundation. Music by Magpie, DC Labor Chorus, U-Liners and Peter Jones/Steve Jones/Laurel Blaydes. I'll be there. Hope to see you there too!